Baxter Springs received its name from the original resident of the area, John Baxter. Springs came from the fact that magnificent springs did flow freely and abundantly from the hillside across from his homestead. The mineral content of the springs had long been recognized by the Osage Indians and passers-by as early as 1800. A natural camping place, it was also believed to be a place of healing. Numerous trips were made by the Osage along the Black Dog Trail to the springs in the belief that drinking the mineral water might have a curative effect upon illnesses. It was deemed that bathing in the waters might rejuvenate the body physically. Military surveying parties led by Colonel Joseph Johnson camped around the springs in 1857. A massive military party consisting of hundreds of soldiers, animals and wagons spent several days around the springs as the survey of the boundary between Kansas and Indian Territory commenced. Col. Johnson wrote in his diary on May 18, 1857 the following entry: "A strong calybeate (chalybeate) spring at Baxter's, or rather two near each other, each rising in the vortex of an obtuse cone of red mud." Chalybeate means tinged with salts of iron. The red mud was undoubtedly the iron content building up from the copious flow of water. Originally, the Military Road was to pass further east of Spring River. But when the road plans were finalized, the route was changed to pass by the springs. The army realized the location to be an ideal camping site along the road linking Ft. Leavenworth and Ft. Gibson in Indian Territory. Since the Indians were being moved in great numbers to the new territory, it was incumbent that they have a good route to travel as well as to patrol the region. The springs became a primary campsite from that time until the Civil War. After the hostilities had subsided, a westward migration of settlers began. Eastern Kansas was an area ripe for settlement. Many immigrants flocked into the area both seeking land and for the purpose of setting up new businesses in the area. The economics for both were realistic. The campsite called Baxter's Springs was well-known during and after the Civil War. The notoriety, of course, came from the infamous Quantrill raid and subsequent massacre. A town quickly emerged on the rise overlooking the ruins of the old fort and the springs on the hillside east of the Military Road. By 1868, the town was teeming with new families building homes around the hillsides and businesses springing up just blocks away to the south. The springs became the water source for the new town. On a note of negativity, the springs also became the primary source of water for livestock which roamed freely around the town. One of the first acts of the newly elected city council was to enact ordinances protecting the springs from pollution by ordering fencing placed around the precious springs. In the 1880's, the possibility of developing the springs to capitalize upon their presumed health benefits emerged. A park was laid out one block square, east of Military Avenue to present-day East Avenue, the springs being situated in the middle of the block. Local papers touted in bold letters glowingly the curative powers of the mineralized waters. The chalybeate springs were advertised as follows: "The springs are well protected, over each has been built a pagoda of fancy design. In the northwest corner of the park has been built an admirably arranged bath house which affords hot and cold baths at all times. During the summer and fall months a silver cornet band discourses sweet music from a stand located in the center of the park." An attractive bath house was situated on the northwest corner of the park. This corner would be 7th and Military. Across Spring Branch from the Main Spring, a sapling grew, which in later years would gain notoriety as being the legendary "hangman's tree." The springs, it was reported in the local papers, were recognized nationally for their curative effect for any number of maladies. The advertisements touted the healing powers of the springs. It was reported that many did come. However, they failed to report how many visitors received "the cure." Situated two blocks south of the springs, a lavish hotel sat at the edge of the business district. The hotel was constructed to house the many tourists traveling by train to town. 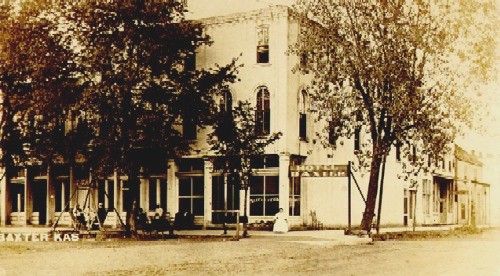 Initially called the Planters, and then the Wiggins, the hotel was later renamed appropriately the Springs Hotel. This spacious hotel was Baxter's finest and one of the largest in the region at the time. Sadly, this fine and beautiful building was abandoned after the turn of the century and destroyed by fire in 1913. The springs were an important asset to the region for much of the early history of Baxter Springs. They continued to flow until the early part of the past century. It is believed that the development of the mining industry was, in large measure, a contributing factor in the drying up of the springs.